Last month I shared here about researching family history, and many readers responded, saying they were encouraged to begin their own family history research. I hope some of you have gotten started or plan to in the new year! 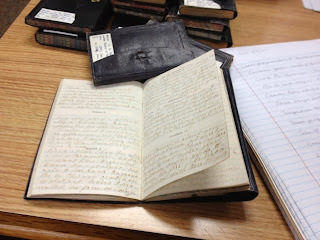 Another way of learning about your ancestor’s lives--or maybe your ancestral hometown's history--is to locate personal diaries and journals written in the past. 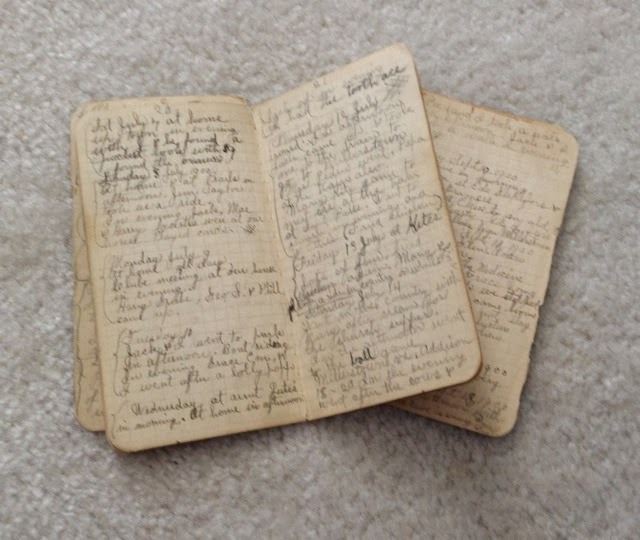 One artifact that came to me through my dad and his family was a small notebook. It wasn’t intended to be a diary. In fact, the name "Wigwam Tobacco" is imprinted on its cover. Even back then they were making promotional items to advertise a product! It may not have been a real diary, but my paternal grandmother, Edith, decided to make it one. And for a bit more than an entire year, she recorded her life in that little notebook. There wasn’t a lot of room for her to write, but through those pages I was able to read about a year in her life as a young woman on the verge of falling in love. This was very special to me because I never had a chance to know her since she died before I was born. She began the diary in August of 1899 and the last entry was made in September 1900. Through the pages I read about a young man named Jack turning her head, her celebration of the turning of the century on 1/1/1900, and her mother dying that May. What really caught my attention though, was the sweet flirtatious attraction between Edith and Jack, who would become my grandfather. It seems that although Jack was interested in Edith, a pretty girl or two would still capture his attention. Or, at least it seemed that way to Edith :-). They often attended dances, coming alone, but then at the end of the evening Jack would walk her home. One summer night she walked into the dance and the Tumbolt sisters were there. Jack having a good time. The following day she says she went uptown in the evening. Saw Tombolt girls AND saw Jack. She put the emphasis on the word "and." I could almost feel her stomach growing hot as she watched my grandfather probably cajoling with the Tombolts. At least it made good fodder for a story. And a story I wrote for a fiction writing class I was taking. A lot of the story came from my imagination, and the Tombolts were there to be sure. Fast forward to this past fall. While researching for my current work in progress, a 19th Century story set in Lake Geneva, WI, my hometown (which is not the same town my grandmother lived in), I attended an event at the town's museum. The speaker mentioned a set of diaries written by a lady who live in the town during the 19th century. Her seventeen diaries, dating from the Civil War up to the early 1880s, are housed in the archive library located at the University of Wisconsin-Whitewater. When I heard this, I couldn’t wait to get to that library and look at the ones written in 1871 and 1872, the time when my story takes place.What better way to read about life in my story setting than that? I did not know the lady or any of her descendants, but I knew the house (long since torn down) that she lived in. The flavor of the town seemed to leap off the pages. 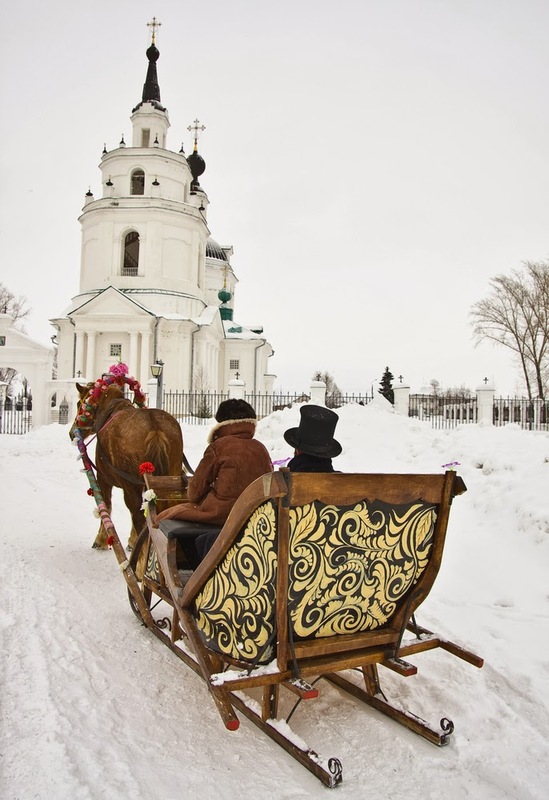 For example, in winter she took a horse-drawn sleigh to church, and one time she and her husband took a horse-drawn sleigh across the frozen lake where he "found an Irishman" there and hired him to chop firewood. Later in my reading, her husband suddenly took ill and died a few hours later. I gasped and said, “Oh no.” By that time I felt I really knew Eliza and blinked at tears as she described her grief. I wished I'd had the time that day to read through all 17 diaries. But I'll have to save that for another time. My research makes me wonder what else is housed in those archives. You can be sure I’ll be heading back up there as soon as I can to find out. Your family may not have passed down a diary, but something else. Perhaps you have some letters or postcards. Or possibly some newspaper clippings or a cookbook with notes written in the margins. What artifacts from the past do you have that tell you about your family several generations ago? What I'd give to read a diary an ancestor of mine had written! My mother has spent a lot of her adult life labeling the back of old family photos and trying to organize them. She's also been a collector of newspaper articles and she found a lot in my grandparents' house after they passed away. I'll have to ask her to show me some of them next time I go see her! Thanks for a great post! Old letters written by my great grandparents is what inspired me to write Love Stays True. I have a scrapbook of my grandparents early pictures, obits and other family information that I put together and now it fills three three ring notebooks with info I've found including old wills and other documents. My greatest treasures are a mirror that hung over my grandmother's fireplace as long as I can remember, and a lead crystal bowl that she received as a wedding gift in the early 1900's. I passed it on to my oldest granddaughter when she married because that's what Mimi told me to do after she gave it to me as a wedding gift. I also have my grandmother's desk and am using it as my desk now. It's made without any nails, but the handles are now screwed on instead of glued. I work at a Mennonite museum in my area that contains quite a number of artifacts from my mom's side of the family. One of the things that I love to tell people about is the wooden trunk that my great-great-grandfather brought over from Germany in 1883 when he fled from conscription in the German army (a great-aunt has his German Liberty pass). All of his worldly possessions were placed in that trunk (about 2'x1'x2'), including a tablecloth his mother gave him for his future bride. Sadly, the tablecloth has disappeared, but I love looking at that trunk brought to NY by a brave 22-year old who became a respected bishop in the community at age 35 and served in that capacity for 57 years. The museum itself is housed in the homestead built by my great-great-great-grandfather in the mid-1800s. Some of the items there are original to the building. I am blown away sometimes when I stop to think that those items were owned by my ancestors. It almost doesn't seem possible that I work around something so historical and with personal ties to my family.